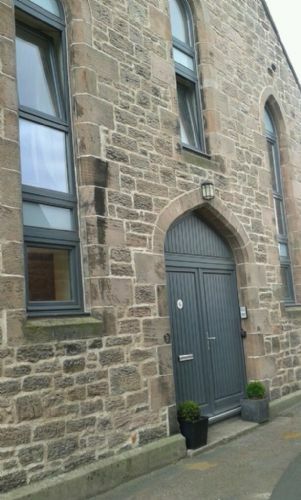 This ground floor apartment is part of the historic Old Templars Hall and is only 60 metres from the sandy beach of Spittal, Berwick-upon-Tweed. Decorated in contemporary style it has been awarded GOLD by Visit England and so a high standard is assured. Free WiFi and a 'smart tv' is provided, with a 2nd tv in the bedroom. This is a great location for exploring the beautiful coastlines of Berwickshire and Northumberland. Recent stay at Templar’s cottage. A very clean and well equipped apartment. Location ideal for walking. Pet friendly. Would be happy to return visit perhaps when the weather was a little warmer. We stayed here for 4 nights with our Golden Retriever and the location is amazing. The dog was in heaven going for a walk on the beach 3 times a day and there is a lovely dog friendly pub nearby as well. The cottage is small but very comfortable and well thought out. The bed was large and comfy with black out blinds in the bedroom so we slept really well. The kitchen was well supplied and there was a DVD player with a wide selection of DVD's for those quieter nights in. There is a really good shower cubicle in the bathroom, with decent water pressure, as well as a bath and the welcome basket and dog towels were a really nice touch. The only thing I would change is to put a door directly from the living room into the back yard as our dog loves to sit outside and sniff the air and it was awkward having to go out the front door to come back in the side but this is a minor thing given how nice the beach was at the end of the road. I would definitely go back again as this was a really lovely, well considered cottage in such an amazing location. This was a great find - so near to the beach. A very comforable and well kitted out cottage. Will use again. We are very disappointed that, despite saying that Templars scores 5/5 on every section, and that you want to come again, you won't recommend Border Holiday Homes to others and that you think you didn't get good value for money. We try our utmost to provide top quality accommodation for our guests with everything provided and, if you had booked directly with us (rather than making us pay commission to an agency), your dog could have stayed at no charge. Two things to bear in mind about Templars Cottage. First it is in fact a ground floor apartment with access to the outside space out of the front door which gives onto the street and in through a gate. Secondly Spittal is on the outskirts of Berwick on Tweed. The beach is spectacular and wonderful for walking but that is the only attraction anything else is a car ride away although the position for exploring Berwick and the coast is excellent. The property itself is of a high standard. Comfortable bed, lovely bathroom and well appointed kitchen with a generous welcome pack. The shop a couple of minutes walk away has great bread and cakes. Glad that you enjoyed your stay. BHH believes its properties offer great value as they are amongst the most highly regarded in Britain so we are sorry that you thought Templars was not so good for value or well located for guests. You are incorrect in stating that Templars gives onto a road - it gives onto a pedestrian walkway to the beach, the only motor vehicles permitted are emergency service vehicles. Booked the apartment through Itison.In a great location near the beach and very comfortable and clean. We thought the £20 charge per night for the dog was a bit steep and were disappointed that there was no welcome basket. Grateful for the lift from the station though and really enjoyed our stay. Pleased that you liked the apartment. You obtained a special rate using your voucher and this meant that we could not provide our usual welcome basket and we did tell you of this through your booking process. You did receive a free collection from the station which, had you taken a taxi, would have cost around £8. If you come again and book directly using the special discount we offer returning guests, there will not be a charge for your pet. Fantastic cottage. Fantastic location. Fantastic customer service. I can't wait to go my daughter back again ! Loved this cottage was lovely, lovely welcome pack and great customers services, will loved to return later in the year. Great location right next to the beach. Fantastic for dog walks. Apartment is warm and clean and comfortable with everything you could need. It was our second visit, and it won’t be our last. Perfect location,with everything you could need.Comfortable and well appointed.The only thing that could be improved would be access to the garden. We had a minor problems which was promptly dealt with by the friendly owners. The initial booking process and follow up was excellent. Everything about this cottage was high quality - really comfy beds, great shower, well equipped kitchen, 50 yards from the beach and in a lovely quiet area. However, the lounge wasn't very big and with the sofa bed down (which we needed to use) it was almost impossible to move around so too small for our taste and needs. Don't be put off though if you just need one bedroom - it is a really nice cottage. Perfect location. The flat is very comfortable. Would have liked more information on how to use smart tv function. A lovely cottage in a lovely area. Plenty of places of interest to visit within a few miles of Spittal. The garden/bbq area is not easy to use. Have to take everything you need out of the cottage with you or go back and forth through back gate and front door (see lock problems below) then unlock backgate padlock to access. There is no direct access from the property to the back area. Good idea if rear window converted to a door to allow this. Currently the main (and only) door access to the property is a multipoint locking system which became our Nemesis as it would often leave us with a key just rotating in the lock Or unable to remove it. Annoying and needs changing. From the moment we arrived this cottage was brilliant - location (50 yards from the promenade), comfort - superb and John and Christine were wonderful hosts . Spittal is an unspoilt village but with all the amenities close by for essentials. Cottages of this calibre are not easy to find but when you do you know you will be going back again and again. Thanks for those lovely comments. We look forward to your next visit and have ordered good weather for your stay!!! The ground floor apartment was perfect for our needs, two adults and a dog fitted in nicely. The level of cleanliness was exceptional it was warm and welcoming after long walks along the coastal paths that you can start from the doorstep of the apartment. There was a basket of complimentary local produce beer, porridge, sweets, jam and biscuits and some milk were very thoughtful and we managed to make our way through them all throughout our stay. There was also a doggy basket with treats and towels which was very thoughtful. The apartment is yards from Spittal beach which is dog friendly with plenty of bins to dispose of the doggy poo bags. The hosts were very friendly and were easily accessible by telephone. All in all a smashing little place. Excellent accomodation very clean, fully equipped. Very close to the beach. Would recommend. Owners very friendly and helpful. Templars is a clean, warm, and well equipped cottage, a real home from home, and the welcome basket was a really nice gesture. The cottage is not really pet friendly, there is no garden, only a small yard which can only be reached by leaving the cottage then through a padlocked gate. Being so close to the beach the location of this cottage is good. A perfect location so close to the sea and the beautiful countryside of Northumberland and Scottish Borders. The cottage has everything you could possibly need and a lot more beside with lovely touches. The welcome basket was appreciated as was the personal greeting. Thank you. We thoroughly enjoyed our stay at Templars Cottage. Less than a minute to Spittal Beach and walking distant to town centre and easy access to neighbouring towns and villages. It was well looked after and perfect for my husband and I and our infant daughter. Highlights being how dog friendly the property and surrounding area was. Great attention to detail with dog supplies so our dog was fully catered for too. The welcome hamper was a lovely touch and to meet the owners on arrival helped settle us into our stay. We made use of the drawer full of visitor attraction leaflets and the walking route maps and this helped us plan our trips each day. Thanks again Christine and John. We've stayed here two years in a row now and will be back again. Location is brilliant! The fact that it is dog friendly is just fantastic as our little dog loves the beach so much. We get up very early and go straight out to see the sunrise. A lovely small apartment in a great location very close to the beach. Made very welcome by the owners, who even provided some toys and treats for the dog! Well equipped apartment in a good location, everything we needed as a base to explore the area. May have taken eye off the ball! Lovely cottage in good location and facilities and equipment good. However when I pay top buck as this cottage is, I expect it to be perfect. Lights not working flashing clock constantly in the bathroom, not fixed before a new customer arrives is not acceptable for this standard of acomodation, the garden area was not inviting at all and clearly had not been maintained in some time with tired looking garden furniture and the moss covering the patio slabs will testify, that did,nt grow overnight. Pity but gets great reviews as it should but looks like complacency is setting in here....eye off the ball deffinately. I've put a yes to recommend this property because I think they may sort things out. We had a great stay at Templars Cottage and could easily stay here again. The welcome basket of goodies was a surprise and we were very grateful for the tips and suggestions from our hosts. Ideally located within a two minute walk to the beach. The property is immaculately clean and everything is provided including a welcome basket. A perfect base for exploring the beaches of Northumberland with parking on the road to the side of the property which is a rarity with most holiday rentals. It has the added bonus that pets are also welcomed. Situated just across the river from the town of Berwick-upon-Tweed the cottage is ideally situated for visiting both the Northumberland coast & the Scottish borders. Very well equiped the cottage is suitable for a couple to use as a base & the hosts are very welcoming & full of information about the area. Was so lovely to have a break away at Templars Cottage. Brilliantly located in the quiet area of Spittal and the beautiful beach and promenade can be seen from the front door. Less than 2 minutes walk away are regular buses into Berwick and a great base for many lovely walks. The apartment was beautifully done and the little extras such as a welcome hamper, tea, coffee and dishwasher tablets were hugely appreciated. Really beautiful apartment, we'd definitely come back, thank you! A very enjoyable stay, lovely accomadation, attention to detail very good, the local area was very good, everyone friendly. This is the 2nd time we've stayed at this cottage. It is in the perfect location, right on the beach, and an easy walk into Berwick upon Tweed. There are supermarkets (Tesco, ASDA, M&S) really close by plus shops, restaurants, cafes and pubs not too far either. The cottage is well equipt, comfortable and feels very homely. The little local produce care package was very much appreciated too. We will definitely stay at Templar's again. Great accommodation and great location. Really lovely apartment in excellent location for Berwick and nearby attractions, like Bamburgh, Alnwick, Edinburgh and Holy Island. Fantastic base. Perfect for dog owners with a dog-friendly beach practically on the doorstep. Friendly host; nice to have a welcome basket with some local produce, and milk in the fridge. Excellent central location to visit Northumberland coastline. Great little home from home with everything you would possible need. Dogs loved location beach less than 1 minute walk so they were in their glory. Found all people in area very friendly especially with dog and very accommodating when it came to eating out a very dog friendly area. A lovely break in a tastefully refurbished period building. We had a great stay in Templars Cottage. The cottage is warm, cosy and fully fitted out with everything you could possible want. From the time of making the booking Border Holidays provided excellent customer service and the welcome basket of local foods was a really nice and weldcomed touch. We spent three lovely day in the area and throughly enjoyed oursleves despite the storm that was hitting the east coast. An added bonus was that we were able to bring our cat along for the break which was just Purrrrrfect (sorry couldn't resist). What an amazing holiday cottage this was! So close to the beach and a short walk to Berwick which the dog loved! Apartment was spotless and had everything we could have asked for and more! The finishing touches such as a welcome basket with local produce and the dog towels and biscuits were fabulous! Can't wait to return! Thanks for the super comments. It s lovely to have such caring guests who looked after the flat so well. Templars cottage is a small but excellent place to stay. The inside is new, clean and very welcoming and the effort from the owners to make you feel welcome is great. The cottage is a 100 yards from the beach, an excellent place to stay if the sea is the place for you! Had a lovely wee break at this flat. A stunning property seconds from the beach, and a stones throw from the pub which meant everything thing on your doorstep. Clean, modern and very welcoming. The basket of local goods on arrival was a nice touch. Highly recommended this flat you will not be disappointed. I booked my mum in here, and once again she had a fantastic stay at Templars Cottage. Brilliant location, and brilliant accommodation. Will definitely be back. I would rate it a 10 out of 10. Such a beautiful cottage with an amazing view. The place was shining clean. Would surely recommend it to anyone visiting Berwick. What a wonderful little find. Cosy, well equipped and inviting against inclement weather. Will return with gusto and fond memories. John and Christine, great, knowledgeable and flexible hosts. Fantastic short break at Templars Cottage! Met on arrival by a lovely woman called Christine who took the time to show us around the cottage and also provided a welcome basket with some essentials and treats. Cottage was lovely, very clean and cosy and 30 yards from Spittal beach where our small dog had a ball. We will definately be back. Possibly the best self-catering place we have ever stayed in. Possibly the best self-catering place we have ever stayed in. Capped by the location - so very close to the sea front. A beautiful cottage located in a very quiet part of spittal, and just a hundred yards from the seafront. Very clean, comfortable and modern. I would highly recommend it. Templars cottage is ideally located to explore the surrounding area and just a stones throw from the beach. A lovely little cottage, very clean and beautifully furnished with everything you could ever need! Ideally located for sightseeing the borders area. The cottage is situated so close to the beach. However, it could do with some small repairs. 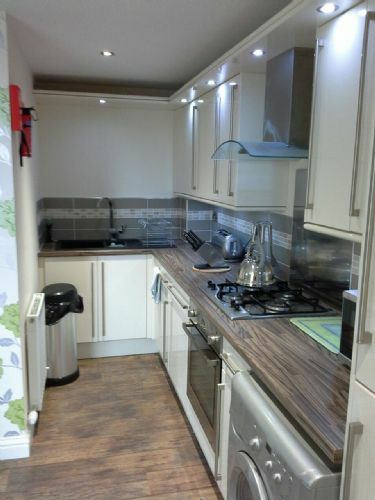 The bed is extremely soft,some of the kitchen items could do with being renewed, the tiles at the back of the sink need resealing and the waste bins are not best suited for a kitchen. That said we had plenty of towels, beach towels and a very warm welcome from the owners parents who couldn't do enough for us. Thanks for taking time to leave your comments. I am glad that you generally had a had a good holiday. Both John and I were surprised that you found the bed 'soft' as it is a high quality back care divan. I wonder if the five star pillow topper mattress was not to your taste and comfort as you mentioned that you had some mobility problems. Thanks too for pointing out the small area that needs resealing in the kitchen. This has been repaired now. all good , great TV , good shower , nice bedroom comfy bed , great kitchen area , on street parking no problems , living room /sitting area on the small side but nice and warm , great location ,plan to return . Response to our request to book the cottage was very quick and further details about the cottage and directions were also sent. Cottage was just as described lovely and very clean with a well equipped kitchen. Welcome basket was great with samples of local produce. It was nice to walk a few minutes from the cottage and be able to walk along the beach. Berwick upon Tweed was only a short drive away and had some really good places to eat. We went to Templars Cottage to rest and it was the perfect venue for this. The owners were vigilant and responded to any of our requests immediately and these requests were only in relation to practicalities. The cottage is located in a rally quiet area . Parking was excellent. I booked this for my mum, after previously staying there myself. Mum was was over the moon with Templars Cottage. She didn't want to go home. Everything that you could possibly need is supplied. Absolutely superb. Location to the beach is second to none. A beautiful all ground floor apartment for 2 in a historic building.. Very clean and tastefully decorated. A small hamper with samples of local produce was a great idea..
You can see the sea with crashing white waves from the front door - it is a lovely stroll down the prom to set you up for the day. A general stores only a short stroll away and supermarkets a short drive. This location was perfect to explore the north east I would stay here again. We booked to stay 4 nights at Templars Cottage in Spittal near Berwick. It was a bit last minute but the pictures were very inviting and we were not disappointed. The liaison with the owners was very easy and the instructions for our arrival so straighforward. The cottage is lovely, very well appointed, clean and cosy. It has everything you would need and more, the bathroom is luxurious and the bedroom very comfortable. Although the weather was very wet, we were able to relax in warm surroundings and being able to bring our two dogs was great. The cottage is an easy walk into Berwick and being located so near to the beach is wonderful for our Hounds. The local people were friendly and we would like to return, hopefully when the weather has improved. We wanted a place to stay for a peaceful break and we had a brilliant time. There was everything we could need in the accommodation and the location was good for a walk on the beach and to get to other nice places. Fabulous cottage with excellent facilities and Central Heating which was essential in November. Wonderful personal welcome from Christine who gave great local information that really made our stay as we took her advice on the Coastal Walk and seal watching at Eyemouth which were huge highlights of the trip. Would love to come back next year-thank you! The cottage was warm and cosy and in a good location close to the sea. We chose this particular cottage because of the location to the sea and the fact that it had an enclosed garden. 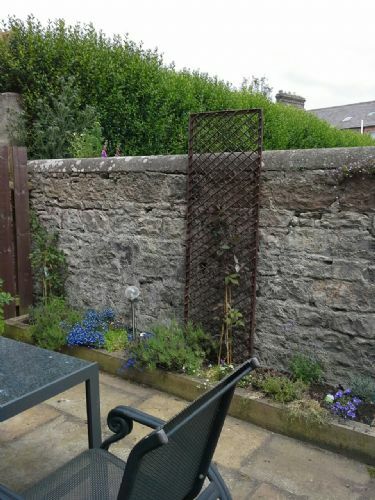 Unfortunately the garden is not accessed directly from the cottage making letting the dog out a bit of a performance especially as it rained most of the time. The gate on the garden didn't have a catch and couldn't be closed! The dryer came in very useful as we had a lot of wet clothes due to the weather. An amazing cottage, so close to the sea. The little touches like the welcome basket made it very special. We loved the honey so much, that we spent a small fortune at the honey farm!! I cannot praise this little gem of a place highly enough. Beautiful!!! 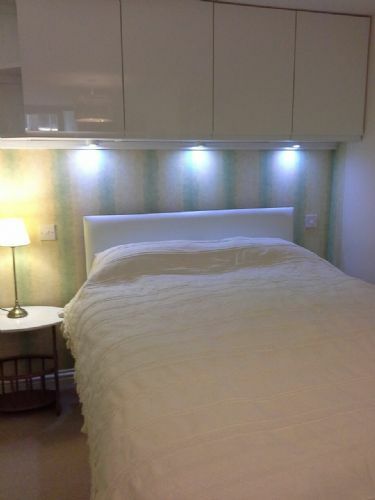 Very nice flat with plush fittings & furnishings. A 'Smart' TV too. Very close to the beach (great for dog) but just set back enough to avoid the sea air! Everything you need for a comfortable stay. The cottage is well maintained and tastefully furnished. We enjoyed our short stay and would book again still lots we haven't explored in Berwick. A nice well appointed holiday cottage. Good quiet location. Excellent holiday home. Lovely clean beach but promenade could do with some cleaning. Lots of dog dirt. Good area for touring around Nothunberland and district. People friendly enough. We thoroughly enjoyed our stay at Templar's Cottage. It was an excellent base from which to explore the area, and enabled us to see nearly all the attractions we had planned to visit. As we have a small dog with lots of energy the close proximity to the sandy, dog friendly beach was an added bonus. We appreciated the welcome pack on our arrival, and found that as there were so many supermarkets just a short drive away, food shopping was never a problem. We were fortunate to have fine weather throughout our stay so we were out a lot. Our only observation would be that as the cottage is on the ground floor, if one was housebound because of the weather, whilst one would certainly be cosy, it might be a bit gloomy. However, this wouldn't put us off re-booking in the future. What a fantastic place. Very high quality.Ideal for the 3 of us. (1 being our dog Scarlett!). lovely and clean. A very small walk down the road to the beach. The beach is very clean and dog friendly. Thanks for a great holiday. Templars was a great base to see the surrounding areas and to explore the Borders, We packed a lot into our two week stay and thankfully the weather was kind to us. Unarguably the property is excellent value for money. I must apologise again for the cottage being not absolutely ready for your arrival. This was not caused by any inefficiency on our part but by the previous guests' delayed departure. I am sorry that you found the noise of children playing noisy. People use the pedestrian only lane, past the front door, to walk to that great sandy beach 50 yards away. It is possible that this was what you found distracting. As you say in your review, Templars' location is great to enable you to see and explore the area. Many guests have returned for second and third visits. I do hope that you will come back too. Since your stay, "Visit England" have given Templars a "Gold Award" again. We had a lovely stay here in this very close to beach apartment. The apartment was like being at home. It had all we needed for our holiday. All the finishing touches made it a very nice place to stay. A lovely comfortable bed gave us a relaxing sleep. We would definitely stay there again. Thank you for letting others know about this fantastic apartment and its close to beach location. Our guests love the coastal path that runs close by going towards Holy Island. We all had a great holiday.. ( Hudson our Lab included).. Thanks for the reply. I think your comment about converting the window into a French door is good but the building is graded and so changes to the exterior are not allowed. I hope that you can come again. We have two other pet friendly cottages too. We had a lovely stay here during the Berwick 900 celebrations. Location ideal for sea and buses into town. A real peaceful place to recharge the batteries. Would thoroughly recommend to couples wishing to get away from it all and peace and quiet. Thanks for your very positive and appreciative comments. Charlotte, John and I hope that you will come back very soon. We stayed in Templar's Cottage in April to celebrate my birthday and it proved to be a wonderful base for our first trip to Northumberland. The cottage had everything we needed plus the lovely added touches of a welcome basket, pint of milk, even a roll of dog poop bags ready for us when we arrived. As we brought our dog with us it was fantastic to be so close to the beach. Thirty paces from the front door and we were onto the sand! My only complaint about the cottage was that the water pressure was quite low so running a bath was quite a long process. This, however, is the only negative thing I can think of! Would definitely recommend to others! Excellent facilities, especially the kitchen. Great location. Our 2 year old enjoyed the walk to the beach every morning (pedestrians only path and promenade). Would highly recommend if you have small children as there is plenty of space for a travel cot and proximity to beach is ideal. We had a great stay in Templars Cottage. We were welcomed by the owners on arrival and shown around. It was spotless, modern and had everything you could possibly need! definitely a home from home. The welcome basket was a lovely touch... And a hop skip and a jump from the beach. We had a great stay and would definitely come back. Thanks for writing such an amazing review. We love this flat ourselves as it is so close to the beach and the coastal footpath.The dog also loves it. Do come back or try one of our other properties like Benfield in the heart of the Cheviots. We really enjoyed our short break at Templar's Cottage in September, parking was handy for the property and cottage was lovely and welcoming. Food hamper is always a nice touch. Would reccomend border holiday homes to anyone. Good value! We had a good week, helped a great deal by the weather. The flat was excellently situated with easy access to northumberland and Scotland and was very clean and well equipped. Would suggest a wooden spoon and tea cups but other than that had everything that we needed. The owner was very welcoming and the welcome basket was brilliant with many local products to try and they were all thoroughly enjoyed...even seeking a jar of local honey to bring home. A great holiday, in a lovely town. Thanks for taking the time to review Old Templars Cottage. It is always heplful for prospective guests. I have bought some wooden spoons at your suggestion and added some tea cups. I hope that some gourmet meals will be produced now. Do come again and you will receive a Returning Guest discount whichever cottage you book. Templars Cottage is really an apartment furnished to the highest standards. Ideal for the beach and easily accessible to all parts of the Northumberland and Scottish coastline. Its really good to have guests who have stayed at three of our places! Mr. and Mrs. Rhodes know our properties well and we're very grateful for what they have to tell us. Do come again soon. We had a lovely break at the apartment. The service was excellent, with thoughtful touches like the welcome basket with a selection of local produce. The owners were really helpful and even welcomed us at the station when we arrived in Berwick. The apartment itself was spotless and well presented, with all the amenities close by. Being so close to the sea was also a bonus. We had a lovely stay and would definitely recommend it! The property is in a ideal location being very close to a clean sandy beach and plenty of coastal walking north and south of Berwick. Very comfortable for 2 people and dog friendly make this an ideal holiday base for seeing the area.